Some years ago I mentioned Pleistocene Park, a project in Siberia attempting to recreate what scientists call the Mammoth Steppe, to reduce combat global climate change. Please join me in making a donation, even two dollars can help. More information about Pleistocene Park and how to donate is available here. When people hear the word “mammoth” they generally think of the Woolly Mammoth, but there were a number of other species. 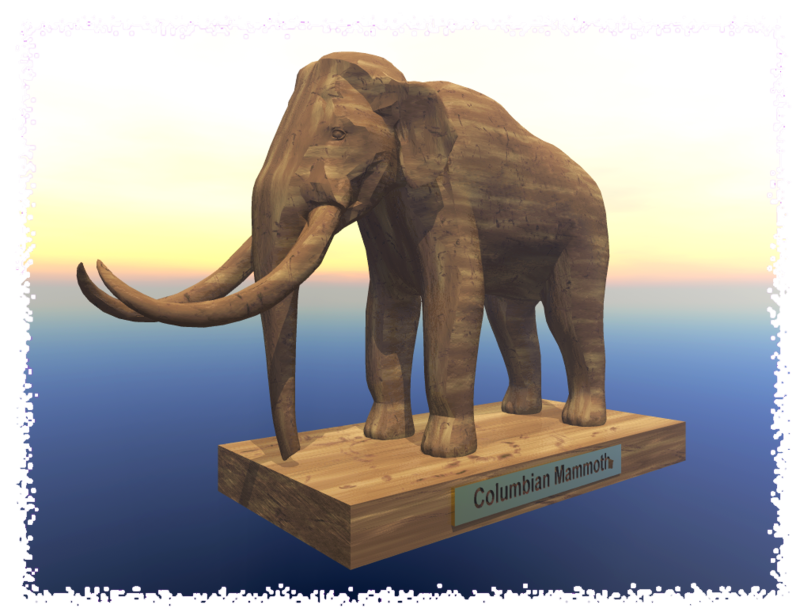 I worked up another image of a mammoth; this time a wood carving of a Columbian Mammoth. The Columbian Mammoth lived in a somewhat warmer climate that did the Woolly Mammoth. As a result its was less shaggy and its ears were somewhat larger. The Columbian mammoth (Mammuthus columbi) ranged from North America to as far south as Nicaragua and Honduras. The species was one of the last members of American megafauna to go extinct, with the date of disappearance generally set at approximately 12,500 years ago. However, several specimens have been dated to 9,000 years ago or less, and one near Nashville, Tennessee, was reliably dated to only about 7,800 years ago. The Columbian mammoth was one of the largest of the mammoth species and also one of the largest elephants to have ever lived, measuring 13 ft tall and weighing up to 10 metric tons (11 short tons). It was 10.7 feet long at the shoulder, and had a head that accounted for 12 to 25 percent of its body weight. It had impressive, spiralled tusks which typically extended to 6.5 feet. A pair of Columbian mammoth tusks discovered in central Texas was the largest ever found for any member of the elephant family: 16 feet long. The mammoth was a herbivore, with a diet consisting of varied plant life ranging from grasses to conifers. Using studies of African elephants, it has been estimated that a large male would have eaten approximately 700 pounds of plant material daily. The average Columbian mammoth ate 300 pounds of vegetation a day. It is also theorized that the Columbian mammoth ate the large fruits of North American trees such as the Osage-orange, Kentucky coffee and honey locust as there was no other large herbivore in North America then that could ingest these fruits. Such tree species were likely dependent upon the mammoth for reproduction, as the seeds needed to pass through the animals digestive system before they would germinate. Being deposited in dung supplied nutrients for the young plant. Is is believed that mammoth and other megafauna species consumed the fruits of trees in Central as South America. The current relative scarcity of some of species of trees may be the result of a lack of megafauna to ingest and spread their seeds. The remains of Columbian mammoths were discovered in the La Brea Tar Pits, located in Los Angeles, California, and the skeleton of one of them is on exhibit in that site’s museum. The Waco Mammoth Site in Waco, Texas, holds the record for the largest known concentration of skeletons of mammoths believed to have died in the same event. This mammoth also lived in Mexico, where its remains are very common. A large individual is the central exhibit in the Regional Museum of Guadalajara, in the Mexican state of Jalisco. In 1998, the Washington State Legislature approved the Columbian mammoth as the state fossil. Additionally, a specimen found in Nebraska in 1922 and named “Archie” is the state’s official fossil. “Archie” is currently on display at Elephant Hall in Lincoln, Nebraska, and is the largest mounted mammoth specimen in the United States.